The American politician Samuel Jackson Randall was born in Philadelphia, Pennsylvania, on the 10th of October 1828. He was educated in the public schools and in the University Academy, Philadelphia. In 1858-59 he was a Democratic member of the state Senate. During the Civil War he served as a private in the Union army for ninety days in 1861, and two years later took part in the Gettysburg campaign as a volunteer. From 1863 until his death he was a Democratic representative in Congress. During the session of 1874-75 he first gained a national reputation by the masterful manner in which he prevented the Republican majority from passing the Force Bill or Federal Election law. Under his leadership discipline and party harmony were established among the Democrats for the first time after the Civil War. He was Speaker of the House from December 1876 to March 1881, during a period marked by rancorous debates concerning the disputed Hayes-Tilden presidential election. With the disappearance of the Reconstruction questions and the emergence of the tariff issue, however, his influence began to wane. As the leader of the Protectionist wing of the party he was superseded by the tariff reform advocates, such as John G. Carlisle, William R. Morrison, and Roger Q. 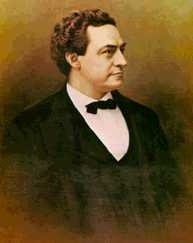 Mills, Carlisle defeating him for the speakership in 1883. He died in Washington DC, on the 13th of April 1890.